plusoptiX12C from Andrew J. Schuman on Vimeo. Amblyopia is one of the most common visual problems of childhood, occurring in as many as 1% to 4% of children. It is defined as poor vision caused by abnormal development of visual areas of the brain; if undetected and untreated it can lead to permanent vision impairment. Unfortunately, less than 21% of children are screened for this condition. Causes of amblyopia include strabismus (misalignment of eyes), anisometropia (inequality of vision of both eyes because of refractive errors or astigmatism), cataracts, ptosis, or other factors. Because children do not complain of problems with visual acuity, and affected eyes often appear normal, amblyopia can easily go undetected unless a child has vision screening done routinely at health maintenance examinations. Vision screening in children aged younger than 3 years in a medical office can be challenging because few children this age can be screened with a vision chart. From age 3 to 5 years, screening is possible with Snellen charts, Tumbling E charts, or picture tests such as Allen Visual Acuity Cards, but this is time consuming and can lead to inconsistent or erroneous results. According to the latest 2017 guidelines Screening instruments detect risk factors for amblyopia, including high refractive error and strabismus. I recommend that Instrument-based screening be performed at age one and repeated at each annual preventive medicine encounter through 5 years of age. Amblyopia remains treatable until age 60 months, with rapid decline of effective treatment after age 5 years. The goal of vision screening in infants and young children, therefore, must be the early detection of high severity (magnitude) amblyopia risk factors (ARFs), including moderate or severe astigmatism, anisometropic myopia, high hyperopia, severe strabismus, and opacities in the visual axis, including retinoblastoma or other ocular entities that cause opacities that interfere with transmission of light to and from the retina. In the Vision in Preschoolers Study, published in 2004, it was found that visual acuity testing (using eye charts) of more than 2,500 preschool children had a 77% sensitivity for detecting conditions associated with amblyopia, while photoscreener devices had a sensitivity of 81% to 88%. Note that the use of photoscreeners not only improves detection of eye pathology but also does so in a fraction of the time required to perform testing with eye charts. 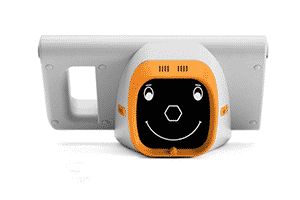 I’ve been using the PlusoptiX S12C mobile vision screener for years and picked up hundreds of children with amblyopia risk factors that have been referred to our community pediatric ophthalmologists. 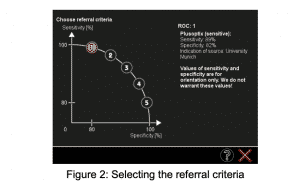 As noted in the video it is important to discuss setting the parameters preferred by your ophthalmologists (which correlate with sensitivity and specificity for detection of risk factors) to minimize over-referrals in young children while avoiding missing children at risk as they approach the age at which amblyopia is not correctable! I last reviewed photoscreening in Contemporary Pediatrics 4 years ago – click on this link to view! Also, PlusoptiX has prepared a nice promotional video which can be viewed here! I plan to write a new review next year. Stay tuned!